Today’s post is by Anne Pawsey, who recently completed her PhD at the University of Edinburgh working on the behaviour of colloids dispersed in liquid crystals. She is currently a post-doc at the Rowett Institute of the University of Aberdeen, but based in Edinburgh. 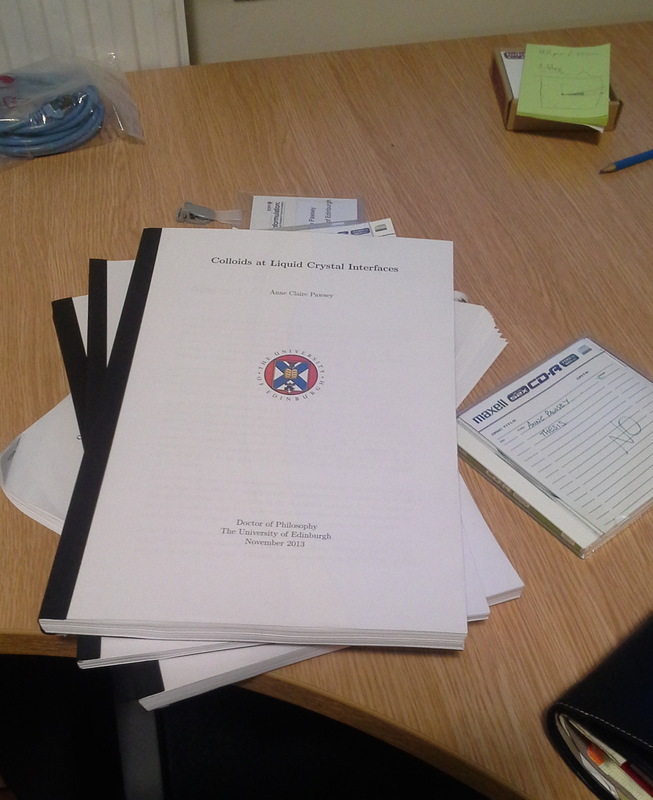 I’ve just finished a PhD in soft matter physics and I’m now working as a post doc. Now that the dust has settled on the thesis I can begin to reflect on the writing process. I wrote up in three and a half months. 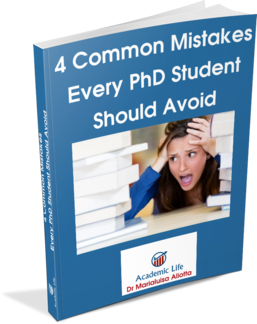 Because of an internship, the process of writing my thesis was entirely separate in time from the experimental period and had a hard deadline as I had to submit before starting a post-doc. Despite beign told to “write as you go along” I hadn’t in any meaningful way, so I started with a very rough thesis outline and two published papers. What follows is a collection of things that I learnt along the way. These are simply things which worked for me, there is a lot of advice out there from people more experienced than me (e.g. this blog, The Thesis Whisperer, and others). I read quite a lot of the advice given, mainly as a means of procrastination if I’m honest, and then used the bits which worked for me. I’ll group the things I learnt loosely into practicalities and the writing process and software tricks. I wrote most of my thesis at home to avoid the distractions of colleagues and to have access to a ready supply of coffee. I took over a small corner of my living room with a desk, desktop computer and a good chair. This was my office. I typically worked there from 8:30am to about 5pm every week day whilst writing up. One of the most important things for me was to treat writing as a job, as such I did not work on my thesis in my pyjamas. I also did not work weekends, I tried to use them to get some fresh air, take a break and see other people. This approach has downsides, although I kept up some hobbies, there were days when I would not see another human being as I live alone. I wish I’d built more regular excercise and socialising into my days as there were times when I was extremely lonely. I worked 8:30am to ~5pm on my thesis during week days with coffee and lunch breaks. I did not use any specific productivity techniques other than blocking time-wasting sites on the internet but often made bread which requires attention at regular (~30min) intervals. I did not spend the entire day writing, I also revised text, reviewed results or read background material in preparation for writing the next section. I aimed to write a minimum of 500 words a day, this is acheivable and gave a sense of process. I decided that complete figures with a caption and all the correct formatting and cross referencing were the equivalent of 1000 words. Keeping to a regular schedule and having acheivable goals were the best way for me to stay motivated. I started my thesis with a rough outline, essentially just the chapter headings. I then agreed a timetable with my supervisor about when he could expect each chapter and when he would give me feedback. This was really important for keeping me on track as I work best with fixed deadlines. On the other hand this was really hard work, I think I might have been happier with a slightly more relaxed schedule as there was no let up. I structured each chapter into sections and then began to fill them in. I tended to write out the opening paragraghs of each section long hand in a notebook and then type them up editing as I went. Once I had got started on a section it was then easier to keep going, typing straight in. I would then do a full edit once the section was complete. I handed each chapter to my supervisor for feedback and started the next chapter whilst I waited for his comments. Once I had all the chapters and comments back I made the suggested corrections and sent the revised chapters to a small army of proof readers, one per chapter. Finally, I gave a final copy to my supervisor to check over before printing. With the exception of the first chapter I wrote, I only made one set of major revisions to each chapter prior to submission as this was all there was time for. This resulted in quite a lot of pressure to make the work as complete as possible before my supervisor saw it and required me to spend a time editing and tidying my own work, something which I intensly dislike doing. Would I do it like this again? I think I would, although, maybe I’d allow myself slightly longer to write or have written more during the PhD. However, the process was hard work but not painfully so. I’m glad I had the support of my supervisor to write in this way as without promt feedback this would have been impossible. There were three distinct types of software I found useful: LaTeX and associated packages, referencing software, and “productivity software”. The latter was I’m ashamed to say the most useful. These plugins for your web browser (I used leechblock) block your access to the distracting parts of the internet (facebook, twitter et al) during the working day and crucially do not allow you to alter the settings during this time. I allowed myself 5 minutes access in every hour. For referencing I used a combination of Mendeley and Jabref. I found that whilst Mendeley was great for searching papers and adding notes, its bibtex output left something to be desired, so I exported these to Jabref before inserting. I have Mendeley set up to watch and sort my random papers folder, I save all papers here and Mendeley sorts them and makes them searchable. Finally, I wrote my thesis using LaTeX, which I recommend. LaTeX has a steepish learning curve so if you are in the early stages of a PhD I recommend using it early on to get the hang of it. One of the good things is that there are add-on packages which will probably solve the problem you are having. On the downside, you can waste a huge amount of time looking for them and getting them to work. Three hours spent getting a package to work properly does not increase your word count but does function as a very efficient form of procrastination. This aside, I found there were a few packages which I wish I’d known how to use before I started. Second, the fancy reference package. I’m not a perfectionist and frequently fail to format cross references consistently; this does it for you. The SI package does the same thing for units. Finally, the subfigure package and all its options, to lay out multipart figures. This page explains all the of the options well. When writing in LaTeX it is useful to be able to count words, I used texcount. And what about you? 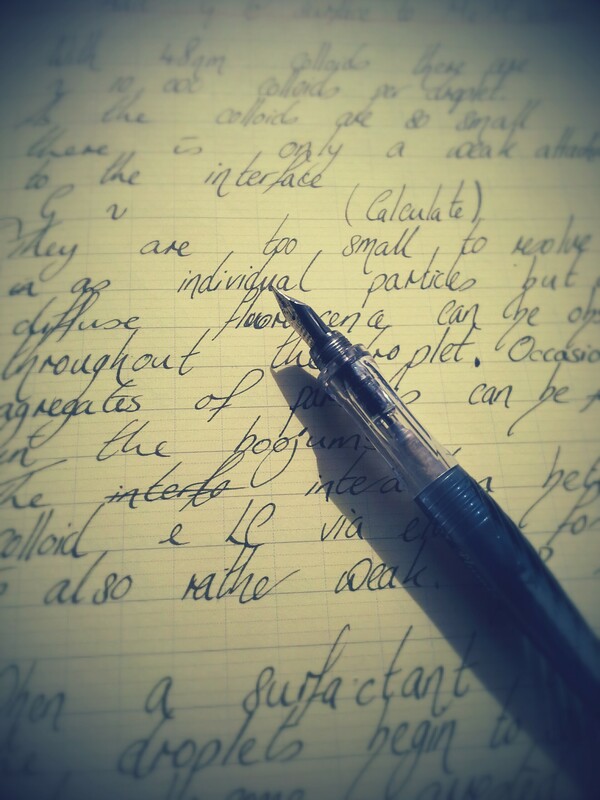 How did you write your thesis? Any advice or tip you wish to share with us? Let us know by leaving a comment below.